The arrival of summer to some signals a change in temperature outside and the transition from wearing layers to wearing lighter clothing, for me it signals the change from drinking warm drinks to iced drinks. There is nothing that puts a smile on my face quicker then being able to order an iced coffee or tea, while out at a cafe or a restaurant. 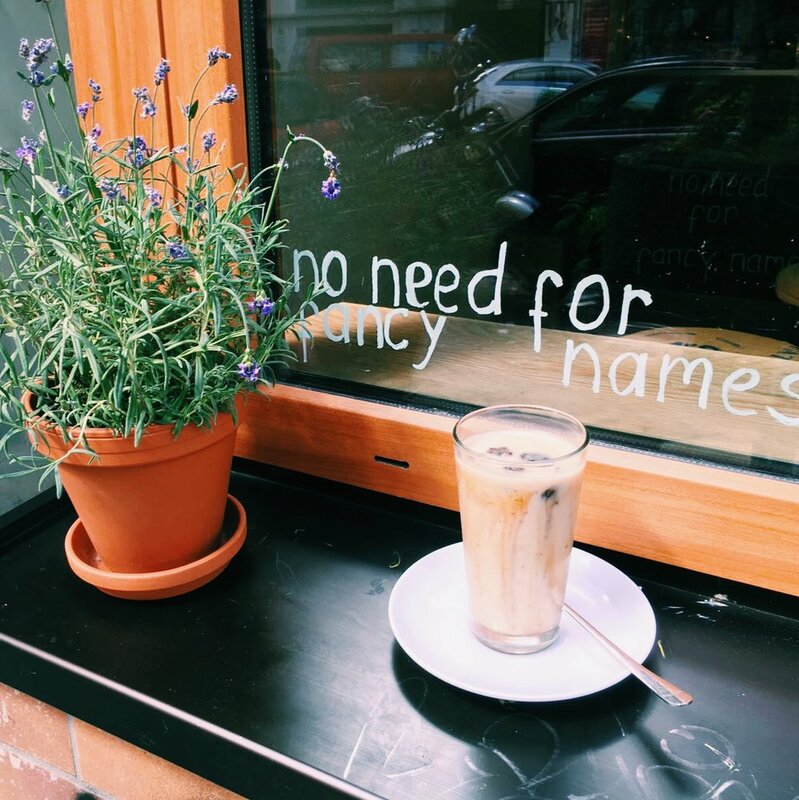 As we are in the peak of summertime, now is the perfect time to write about some of the places in Berlin that I have found that serve some of the best iced (non alcoholic) beverages in town. CHAPTER ONE first stumbled upon Chapter One when looking for a good coffee in my neighborhood, instead of going to the usual trendy cafe that was the old go to place. This cafe is one of the third wave coffee places that have popped up in Berlin the past few years, but it has a more relaxed, unpretentious vibe compared to the other places. When summer hit I stopped by and saw they were serving not only cold brewed coffee but also cold brew tea! I decided to order a milky oolong cold brew tea and was at first enthralled with the amazing milky light green color, and upon tasting it, the rich flavor made me an instant fan. The location has some casual seating out front as well as a cozy interior with a great mosaic floor for days with cooler weather or rain, making it a good place to spend some time in or pop in to take a drink to go! NO NEED FOR FANCY NAMES, this small cafe with a no nonsense name recently opened up on Zossner strasse across from the always busy Cafe Curcuma. This alone was a gutsy move so I decided to stop in and try their iced coffee and was impressed. Instead of pouring hot espresso over ice and adding cool milk they use frozen expresso ice cubes and pour your choice of normal milk or nut milks over it to give you an undiluted iced latte. Not only does this look great, it also gives it a nice flavor. There are only a few seats inside and outside but it's well worth stopping in for a quick coffee at reasonable prices if you are in the neighborhood. JOHN MUIR - when I was growing up Lemonades were synonymous with summer. One balmy evening I joined a few friends in the outdoor seating area of John Muir and stumbled upon this yummy drink. The bar is known for their cocktails, but for those that don't drink alcohol there is this tasty alternative. To make it even more appealing you have several flavors to choose from. On the night that I visited I decided upon a spicy lemon lemonade with a splash of spicey bitters. After discussing the flavors on offer with the bartender, who took the same amount of care making this drink as she would with one of their famous cocktails, I made my decision and it was a perfect combination. A nice change from the usual sodas or water on offer at bars. MACHA MACHA - I stumbled upon this amazing cafe, with a special Japanese landscape garden outside and an ecological tatami room in the back, as I was walking down Hasenheide on my way to Karstadt. When I walked inside I found out they specialize in Japanese green teas and I immediately ordered an iced matcha latte and sat in the front garden next to the Japanese fountain and felt like I was transported to somewhere in the countryside in Japan . The latte was one of the best I have had in the city with five choices that range between ceremonial grade matcha or more standard matchas. They blend the matcha the traditional Japanese way instead of just throwing the matcha into a glass and mixing with milk like other establishments tend to make it. I have returned a few more times trying their other iced green teas and every time I walk away with a smile on my face realizing that I have just left a very special place. UMAMI, when this restaurant first opened I would go and just look at the food menu and never think about trying one of their specialty drinks, one day I took a look and realized that this was a mistake. The first time I ordered a special drink with chia seeds and Aloe Vera juice as well as fruits which was so refreshing, the next time I went back they didn't have that one on the menu but they had another drink with strawberry purée and chia seeds called Morgenrot that was just as refreshing. They have two locations, one in Prenzlauberg and the other in Kreuzberg, both with special interiors and spacious outdoor seating.